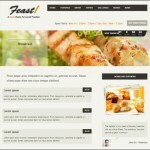 Simple and minimal web design is a popular trend nowadays. Gone are the days when websites full of rich graphics were liked and enjoyed by the visitors – now those websites with heavy graphics that load extremely slowly are disliked by people. In this fast age everyone wants everything quickly, and same is the case with websites. People do not waste time on tough to navigate and slow websites, and considering the huge number of websites available out there, they will surely find an alternative to yours. This is definitely something you don’t want. So in short, having a straight-forward, simple and easy to navigate website is quite logical. WordPress is one of the most popular and widely used blogging/website platforms, and it has its reasons for its popularity and success – the biggest reason being that it is easy to handle, and the availability of themes and plugins make it even more amazing. A huge collection of themes of various types and kinds are available on the web: free, paid, simple and minimalistic, complex and full of graphics, plain and colorful. So you can choose the theme according to your choice, but as aforementioned plain, simple, and minimal themes are the trend nowadays. Plain and simple not necessarily mean dull and boring. You must have heard “simplicity is beauty,” well that is quite true. Minimalistic and simple designs can be extremely attractive and beautiful, and to prove this today we are showcasing a collection of Free Minimal Responsive WordPress Themes. All the themes in this collection are very beautiful but also very simple and neat. So check this list out and pick the ones you like the best! These are all so impressive minimal themes. I can hardly choose which one I like the most.